Tag line: "Oh Yes... Our Wigs Are Made From Genuine Human Hair, And How!" 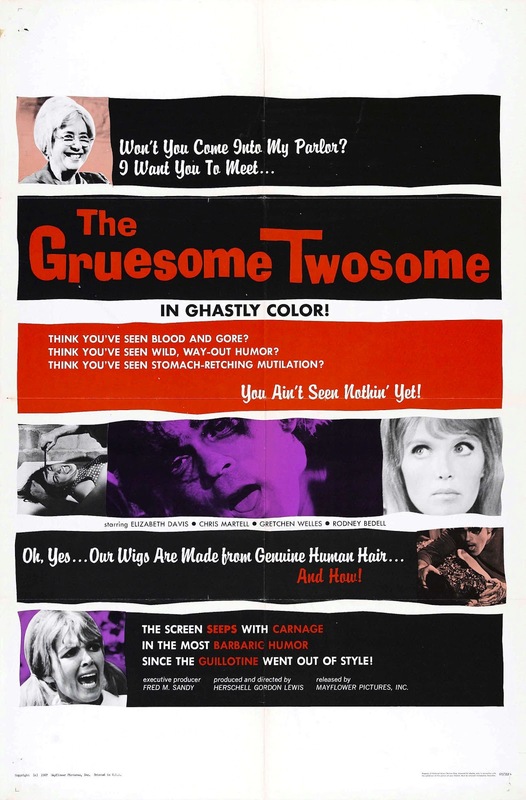 Despite an already-abbreviated running time, The Gruesome Twosome, Herschell Gordon Lewis’ 1967 horror/comedy, still has some fat that needs trimming. As the story goes, Lewis' first cut came in at just about an hour, which was considered too short for a feature film. So, in order to make it more appealing to distributors, Lewis added “filler” to The Gruesome Twosome, to get it to an acceptable length. Unfortunately, these additions don’t work, and the film would have been better if he left it alone. The movie centers on a wig store owned and operated by the elderly Mrs. Pringle (Elizabeth Davis), who offers the most realistic wigs in town, which probably has something to do with the fact they’re made from actual hair! Advertising cheap room and board for college co-eds, Mrs. Pringle lures young girls to her house, and then turns them over to her slow-witted son, Rodney (Chris Martell), who cuts off their scalps before killing them. College student Kathy Baker (Gretchen Wells), who considers herself a novice sleuth, has been looking into the recent disappearance of one of her friends, but when the investigation leads her to Mrs. Pringle’s wig shop, Kathy finds she's in much more trouble than she bargained for. One of the scenes Lewis added to The Gruesome Twosome was a bizarre opening with two mannequin heads “talking” to one another, setting up the entire story. It’s a one-joke sequence, and not a funny joke at that, but at least it’s immediately followed by the film’s first kill. A pretty brunette stops by to see the room Mrs. Pringle is renting, at which point the aged Mrs. Pringle pushes the girl into a workshop of some sort, where Rodney attacks, slicing off her scalp. There’s plenty of blood in this scene, and Rodney takes his good 'ole time with the knife, making sure not to ruin her hair (though the camera does get a bit too close sometimes, inadvertently revealing the prosthetic attached to the actress’s head). Other notable gore moments include a girl (Dianne Raymond) beheaded with an electric carving knife, and another whose abdomen is slit open, allowing Rodney to “play” with her innards. Yet ultimately, there aren’t enough of these scenes to rescue The Gruesome Twosome from mediocrity, and what we’re left with are too many long, silly sequences that go absolutely nowhere. The Gruesome Twosome feels like Herschell Gordon Lewis in slow motion, and though he obviously tried his damnedest to make it all work, his extra scenes only managed to bog down the pace of the film.